The Hidden Picture Aviary contains pretty birds, butterflies and animals, but it also contains the important Zoo-phonics Animals. Look carefully for them. When a Zoo-phonics Animal Picture or a Merged Animal Letter is found, just click on it. The letter will appear on the sign near Zoophonia and she will Signal and sound the letter for the child. Notice that the Animal Letter or Animal Picture will brighten (come out of hiding) so that the child can see it. Zeke gives a lot of encouragement throughout. 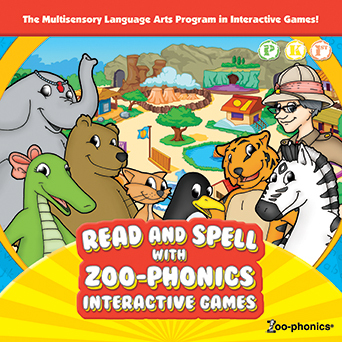 If the child needs to hear the letter sound again, click on Zoophonia. Look at the bottom of the screen for the pair of binoculars. If you click on to them they will help the child find the Animal Letters.